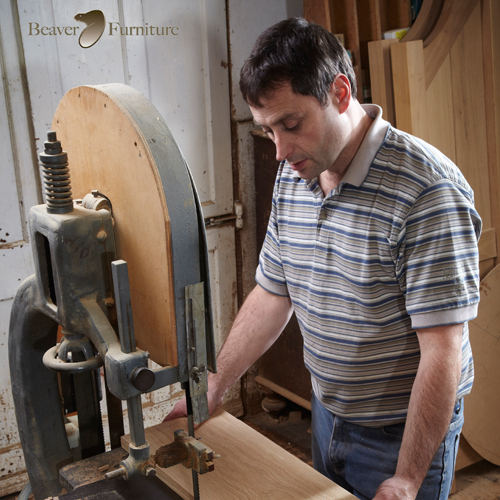 Over 50 years of making bespoke furniture of exceptional character and quality. Our family run business was established in Thirsk, North Yorkshire, in 1960 by the late Colin Almack. Colin's carved “beaver” trademark, which can be found on every piece of furniture we have ever made, was inspired by watching wild beavers’ industriously using wood in building their dams and lodges. Colin became known as the “Beaverman”. The business moved from Thirsk in the early seventies to its present home at Sutton-under-Whitestonecliffe. Colin and, his wife, Pat re-named their new home “Beaver Lodge”. Colin was an exceptionally talented craftsman and took great pleasure in passing on his skills and knowledge to numerous apprentices over the years. David Glegg, Colin’s son-in law and one such apprentice, has been carrying on this tradition for the last twenty years. Colin and David were both presented to HM Queen Elizabeth and HRH Prince Philip, in 1989, for their outstanding work on the New Chapter House at Southwark Cathedral. In 2016 we were delighted to be nominated as a finalist in the prestigious Welcome to Yorkshire “White Rose Awards” the largest celebration of tourism and industry excellence in the U.K.
Whilst the skills and methods of handcrafting furniture have changed very little over the years, the business has evolved and flourished, now our furniture can be found in homes across the world. We have been fortunate to receive commissions from cathedrals and great schools but it is furniture for every room of your home that is the focus of our business. We work predominantly in English Oak (Quercus robur) and ensuring the continuance of this magnificent tree is extremely important to us. We source all our oak trees or planked timber, from sustainable managed woodlands on local Estates or from accredited timber merchants. A local sawmill cuts the felled oak trees into planks which are then air dried at Beaver Lodge for up to five years before being hand crafted into beautiful pieces of traditional and contemporary furniture. If you don’t see what you have in mind we would be pleased to work with you to translate your ideas into reality. Visitors are always welcome to come and watch the craftsmen at work and see the furniture we have on display in the showroom at Beaver Lodge.